Bummer. 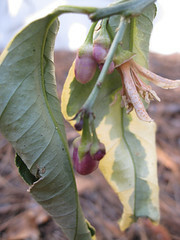 My variegated lemon got fried in this week's cold snap. As I mentioned in my previous post, I was out of town in Washington, D.C. When I watched the national weather on Tuesday morning I found out that the temperature in Tallhassee was 29 while it was 34 where I was in D.C. Gulp. I figured this was probably not good news for all the tender tropicals poking their heads up in my yard. I spoke with a friend later in the afternoon who said that everything in his yard was fine. "Whew!" I thought to myself. I dodged that bullet. But this morning proved me wrong. I was walking around the yard checking for damage. All the tender tropicals made it through, even though they're just tiny little plants trying to get established right now. Heck, even the Thailand Giant Colocasia that I planted just before I left town made it! I discovered my little variegated lemon tree, which was a gift from a co-worker, all shrivelled up and crispy looking on my patio. Even the flowers were crunchy, which was double dissapointing since I had been looking forward to smelling them bloom and then to eating the fruit. The interesting thing is that the lemon was right next to a pot of young banana plants, which made it through just fine. Maybe the orange was drier and thus more susceptible to frost/freeze damage? Maybe it got hit with the morning sun before the banana did and that's why it got crispy? Oh well. The trunk seems to be okay, so I'm guessing the plant will drop its leaves and put out a new flush. In the long run, all will probably be fine. And for those of you hankering for photos of traditional spring flowers (cherry blossoms, hyacinth, tulips, etc), stay tuned. I'll be posting some photos from my D.C. trip soon. Update: So upon further inspection, I think the lemon might have succumbed to drought, not freeze. I forgot to water it before I left for D.C. and my best guess is that it dried out. I'm watering it now to see if it might come back. We'll see. The squirrels are doing their best to curtail the bulb display in my sister's yard in the Washington, D.C., area. I've been visiting with my sister and her husband over the holiday weekend. We did some yard work since the weather was so nice and noticed that several of the bulbs, like this crocus, seemed to have exploded. The leaves are still there but the flowers have been scattered about. We also saw a number of small holes in the ground, but didn't know what was causing them. Until later. Then we saw the ultimate taunt. Not only have the squirrels been eating the flowers, they're also uprooting the bulbs entirely and leaving them on the railing of the deck, as if to say, "You can plant all the pretty bulbs you want but we're just going to rip them out of the ground and treat them as edible delicacies." Damn squirrels. 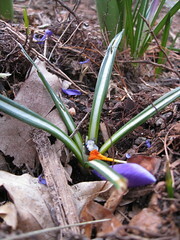 And poor crocuses! I'll bet they were initially happy to be planted so lovingly in my sister's yard, thinking that they'd be destined for a life of suburban bliss. But no, not if the squirrels have anything to say about it. I guess this is a case of nature versus nature, with the squirrels ahead 1-0. 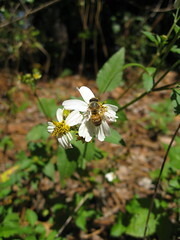 Of all the things growing in my yard, Bidens alba is probably my least favorite. The flowers aren't bad, but once the plant is done blooming it produces these sticky little seed pods, hence the name "common beggar's tick." I typically try to pull these out before they go to flower and set seed, but sometimes the plants get ahead of me. Today I was lounging on my back patio working on a story I'm writing when I noticed that my pesky Bidens were attracting a number of honey bees. As you may know, honey bees have been facing a number of challenges as of late, including colony collapse disorder. Apparently, one creature's weed is another creature's breakfast! Ugh. We have even more pollen floating around in the air. This time I think it's the oak trees that are the culprits. Many of us at the office have been experiencing symptoms -- post-nasal drip, sore throats, and congested sinuses. I snapped this picture as we were heading to lunch today. 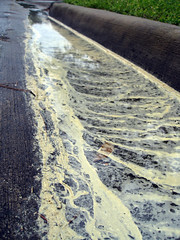 We had experienced a light rain, and apparently it swept all the pollen from the parking lot into the gutter. Can you believe how thick it is? Sheesh. 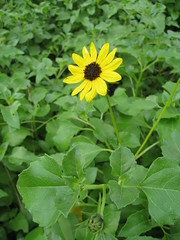 So we're not at the beach, but the garden in front of our office does boast a nice patch of beach sunflower, aka Helianthus debilis. This is the first one to show its cheery face this spring, so I thought I'd capture it for all of you who are still suffering under a blanket of snow. A few weeks back, I transplanted a few seedlings from this patch to my own garden. They weren't looking so hot at first. Of course, this might be because I just yanked them out of the ground like a common weed and then threw them into my sandy, unenriched soil. But hey, anyone who knows my gardening style knows it's all about tough love. At any rate, the transplants finally stopped wilting and look like they're going to make it. I'll blog about them once they start blooming. My first canna of the season is popping its little head above the surface of the soil. I planted this 'Wyoming' canna on February 17, if memory serves me correctly. We've had two cold snaps since then, but they don't seem to have hindered this little guy's debut into the world. The 'Wyoming' cannas have striking bronze/burgundy foliage and produce bright orange flowers -- a perfect look for a bold garden! 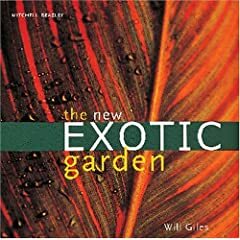 I also planted some 'Bengal Tiger' canna rhizomes (variegated yellow-green leaves and red flowers, also called 'Pretoria'), three Scadoxus multiflora corms (fabulous red globular flowers), three crinum bulbs (classic pale pink flowers), and some white/green caladiums. 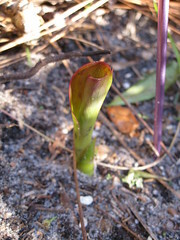 All are in the ground, and so far the cannas and the scadoxus are the only ones popping up. I bought them all at my local Home Depot, but you can also get them through online retailers like Brent and Becky's Bulbs. By the way, the purple rod you see to the right of the canna is a knitting needle. Since I'm planning to add more plants to the bed, I wanted to make sure that I'd know where I had planted the rhizomes so that I could avoid disturbing them if they were slow to pop up. I have a bunch of old knitting needles on hand, so I figured they'd work great. I was even able to color-code them -- the 'Wyoming' got a purplish-colored needle since it has somewhat purple foliage. If you don't have extra knitting needles at your house, you could also use skewers used for making shish kebabs. They're cheap and readily available at the supermarket. There's a cold snap forecasted for tonight. The weather folks say it will get down to 33 degrees (F) but I'm going to be lazy and not protect my plants. 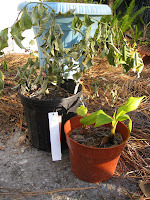 I just get tired of digging that bird-of-paradise around and pulling out the blankets for the in-ground plants. The cold snap we had in February didn't seem to cause too much damage. Plus we had tons of rain today, and irrigating before a cold snap is supposed to help protect plants from cold damage. Fingers crossed! Update: No damage. Yay! One of my co-workers says it dropped to 31 degrees across town at his house, but my plants fared fine. I was on my way to work this morning, zoning out while driving down the same road I always take to work and then, BAM! Where did that come from? 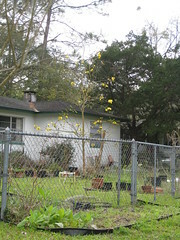 All of a sudden there was a tree I'd never noticed before in bloom with these striking yellow flowers. Being the plant geek that I am, I had to turn around and take a picture. I'm pretty sure this tree is in the genus Tabebuia, though I'm not sure of the species (maybe T. aurea, which used to be T. caraiba). These trees are native to areas further south, and it's somewhat unusual to see them this far north (though we do have several other specimens here in Gainesville). At any rate, I just wanted to share this ray of sunshine with everyone, even if the sky in the back of the photo looks a bit gray.